So what EXACTLY is a Celebrant? Although, I have been a Celebrant for over a decade, I know there are still people who don’t know what a Celebrant is or who aren’t really 100% sure of what a Celebrant does. Celebrants celebrate life and love. Professional Wedding Celebrants help couples to celebrate their journey together into marriage. They work with couples to create a space which on the wedding day is full of love, laughter, happiness and joy. Some Celebrants in some countries can also do the legal part of the ceremony, but many can’t and this is absolutely fine. You can do the legal part at any time, as this bit represents one small part of your ceremony. The other part, the celebratory part, the heart part, can take place anytime, anywhere at any place of your choosing, with a Celebrant of your choosing. Celebrants will help you to plan your ceremony content, and add in all the things you want, and the things you definitely don’t want. We help you to decide on what you want to do with your wedding vows, whether you’ll write them from scratch or choose some pre-written ones that we have available for you. And if you decide to write them, we will be here to help you do it. Yay! We’ll help you decide on what elements you want to include in your ceremony, from music to symbolic rituals, readings and songs. We’re a fountain of knowledge and experience when it comes to designing wedding ceremonies. We’ll guide you on how to make use of your wedding party; bridesmaids, grooms men etc (if you’re having any) and let you know what kind of things they should be doing (and not doing) on your wedding day. We’ll basically make your ceremony process into an enjoyable and fun one, so that you will literally be full of excitement waiting to see it come to life. So there you have it! 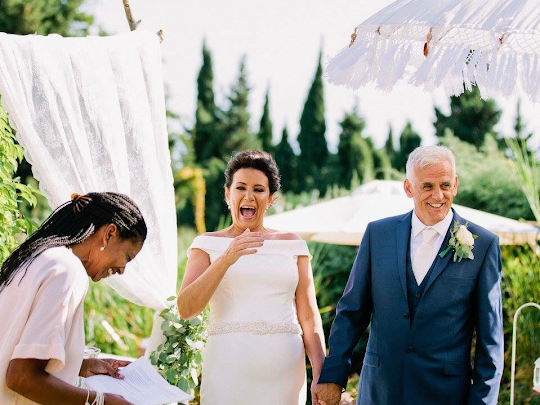 A one-minute lowdown of what a Celebrant is and what wedding Celebrants do. So now you know! If you’d like to contact us to check our availability or for more information, we’ll be more than excited to hear from you! ← Getting married in Spain – where to start?